Pricing performance has picked back up again in the Bay Area apartment market, where rents backtracked in late 2016 and early 2017. For the region overall, rent growth for new leases reached 2.5% year-over-year in early 2018, the highest level since mid-2016. 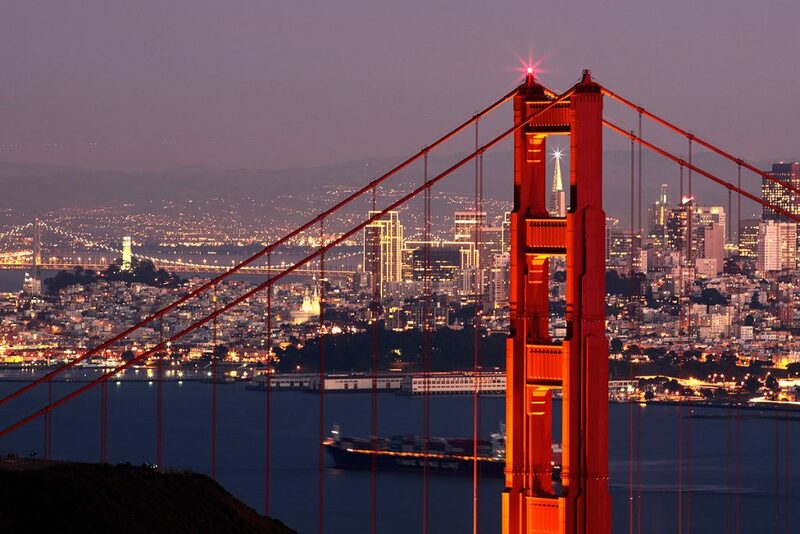 The region’s performance was lifted by improvement across all three Bay Area metros. Bay Area rent performance has steadily improved since the annual cuts roughly a year ago. While that increase was a recent high, it’s far short of the double-digit peaks that made the region a rent growth leader throughout much of the current cycle. Apartment prices in the Bay Area have grown around 52% since 2010, driven by big hikes early in the cycle. The story in the Bay Area changed at the end of 2016, when job growth normalized from robust levels and apartment completions picked up. In turn, occupancy sagged, and operators responded by cutting rents. 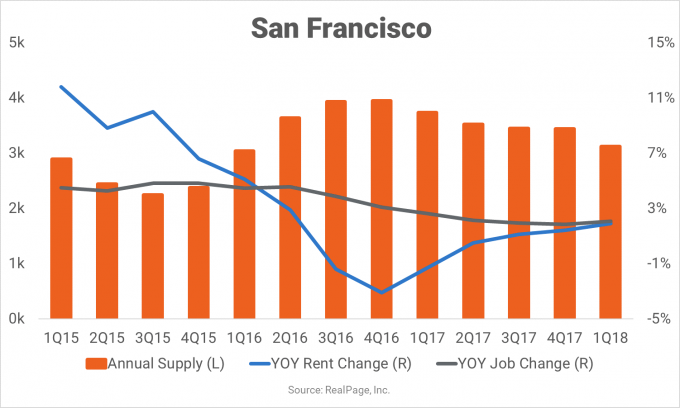 The dip was temporary, though, and now that job growth and occupancy have improved, Bay Area pricing is once again on the rise. 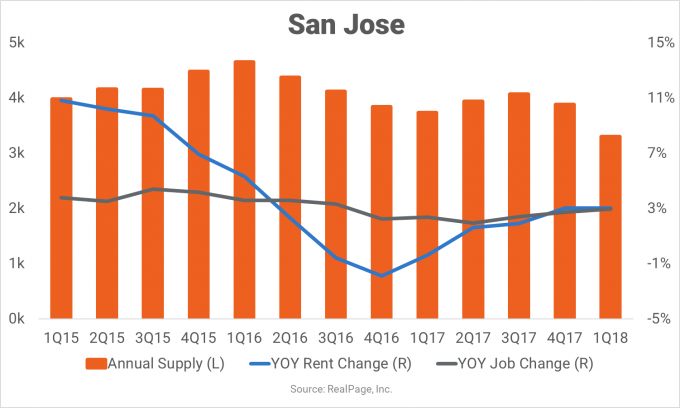 San Jose was the Bay Area’s rent growth leader in 1st quarter 2018, with an annual price hike of 3.0%, ahead of the national average (2.6%). That performance came as annual job gains topped the 32,000 mark for the first time since the year-ending July 2016. In addition, annual completion volumes – roughly 3,300 units – fell to the lowest level since early 2014. With the slower pace of deliveries, Class A performance was strong, with rent growth of 5.1%. Luxury product pushed rent growth to around 5% in South Sunnyvale/Cupertino and Santa Clara. Performance also hit around that mark in East San Jose. While improved, San Jose’s recent growth remained well below the market’s peak for this cycle, which landed near 14% in 3rd quarter 2011. By comparison, the low point came in late 2016, with annual price cuts of 1.9%. Overall, prices in San Jose are now 54.4% ahead of where they were in 2010. 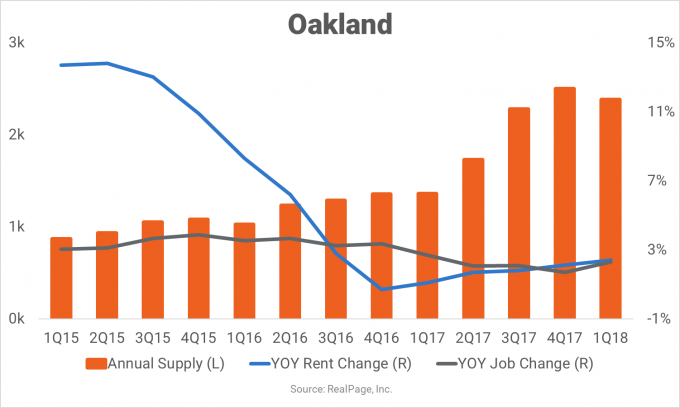 In Oakland, operators raised rents 2.4% in the past year, in line with the U.S. norm. Oakland doesn’t have the housing demand drivers that San Francisco and San Jose do. But Oakland does benefit from its proximity to those metros. In turn, while Oakland typically displays similar patterns as San Jose and San Francisco, the trends are somewhat lagged and the market does not see the same degree of volatility. While Oakland saw pricing performance drop in late 2016 like San Jose and San Francisco did, operators here never resorted to annual rent cuts. Instead, Oakland’s low point was very soft annual growth of 0.7% in 4th quarter 2017. Throughout the course of the current cycle, prices in Oakland have grown 52.3% since 2010. San Francisco recorded annual price hikes of 1.9% in 1st quarter 2018, a showing that grades below the U.S. norm. Still, that performance was welcome after the metro experienced the deepest and most prolonged cuts among the three Bay Area markets. San Francisco is benefiting from the same conditions that have led to improved growth in San Jose – namely, stronger job growth and fewer new apartment completions. But the Class A surge seen in San Jose is not present in San Francisco. Luxury product increased rents only 1.5% in the year-ending 1st quarter 2018, below the 2.3% increase in middle- and lower-tier product. Perhaps one reason that luxury product has been slow to gain traction is that completions are more concentrated in San Francisco than they are in San Jose. Apartment development has been heavily focused in SoMa, which accounted for 65% of the metro’s completions in the past year. By comparison, no San Jose submarket claimed more than 23% of that market’s completions. San Francisco’s annual rent growth peak for the current cycle topped 14% in late 2011, while the lowest point for this metro was annual price cuts of 3.1% in late 2016. Overall, prices here are now 49.6% ahead of 2010 levels.